If you use PointsBet promo code to join this online betting platform you can get the PointsBet sign-up bonus. This welcome offer gets you $50 as a no deposit bonus and two risk-free bets, up to $1,000*. $50 FREE at sign-up + 2 risk-free bets up to $1,000! *Significant T&C: Get a $500 Refund (in Bonus Bets) if your 1st Fixed Odds Bet loses. Get a $500 Refund (in Bonus Bets) if your 1st PointsBetting Bet loses. One bonus per person, household, residence, etc. Only for new Customers who reside in NJ! 21+. Full T&C Apply. Join and choose from the 8 finalists of the NBA East and West Conferences over the 2018/2019 season. The site offers online betting on a range of sports and features a number of promotional incentives such as the PointsBet sign up bonus. PointsBet has also signed an agreement with Topgolf to provide its betting services at this brand’s locations across New Jersey. Continue reading to see what we think about the PointsBet sportsbook and the PointsBet sign up bonus. Bonus T&C: New Customers in NJ! 21+. Full T&C Apply. How To Claim the PointsBet Sign Up Bonus? The PointsBet promo code MAXBONUS can be entered during the registration process, which we will cover below. 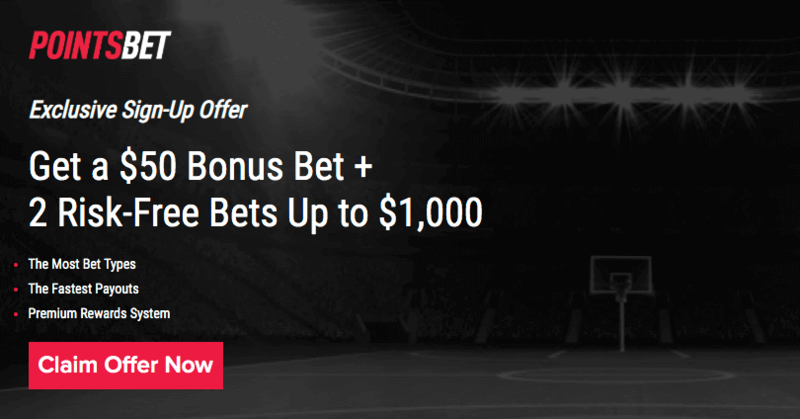 Here is what you can get from the PointsBet sign up bonus in the meantime: This is a good reason for you to bookmark this page and check it out later as we will update this review with the latest bonus code from this operator. Until then, you can still register at this operator without any special bonus code and claim this welcome offer. As we mentioned earlier, to claim this operator’s welcome bonus, you will need to enter the PointsBet promo code during the registration process. Visit the PointsBet website and click on the “Sign Up” button. The registration form will open up. Fill in all the required fields. If you get the PointsBet promo code, remember to enter it in the correct field. Otherwise, just ignore that field as it is not obligatory. After completing the registration process and meeting their bonus T&C, you will be able to claim the sign-up bonus. If you make a bet that wins by one point, you win 1 x of your bet amount (known as the stake). If your bet wins by two points, you win 2 x stake. However, if your bet loses by 1 point, you lose 1 x stake. Lose your bet by 10 points, lose 10 x stake. You can clearly see how wins (or losses) can add up quickly! Points Betting might not be for everyone, but it is a sure-fire way to make a game more exciting. The PointsBet mobile app is available for download on both Android and iOS devices. Now, the Android app can be downloaded right on this operator’s website. The reason for this is the fact that Google Play Store doesn’t allow real money gambling apps on its platform. You can find more detailed instructions about the installation process on this bookie’s website. As for iOS users, they can find the mobile app on their app store. The installation process is the same as with any other app on this mobile platform. The design of the PointsBet mobile app is very well organized. We liked the fact that you can still use the PointsBet promo code if you register via the mobile app on this betting platform. You can also access this platform via the browser-based client on your mobile device. By using the PointsBet promo code and claiming their welcome bonus, you can try more of these games than you would otherwise play. PointsBet uses some of the most popular payment services like Visa and MasterCard. For more details on deposits and withdrawals, you can check your account settings after finishing the registration process. If you have any questions regarding PointsBet promo code MAXBONUS or any other feature from this operator, you can check their Help page. There is also a customer support team which can be contacted via the email address or live chat feature. All in all, this online betting platform has a lot of potentials to become among the leading betting platforms in the US market. We liked the design and their mobile app support. Customer service is on a satisfying level in comparison to the other operators on this betting market. You should definitely revisit this review in the near future as we will update it with the latest information from this brand and the PointsBet promo code.